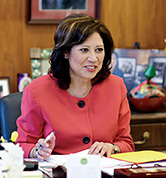 Hilda Solis, the first Latina to serve in the U.S. Cabinet, likes to tell people she was “raised union.” Her Nicaraguan mother worked the night shift in a toy factory. Her Mexican father was the shop steward for the Teamsters Union at a battery recycling plant. Labor issues were often discussed at the family dinner table. As Secretary of Labor, Solis is still trying to sort out labor problems, but on a much larger scale and in the midst of a stubbornly persistent recession and a growing anti-union political mood. As a former Congresswoman and White House aide, Solis is schooled in the ways of Washington and the special culture of the Federal government. But she says she was unprepared for the vast domain she now presides over at the Labor Department, which reaches into so many aspects of American life. She’s comforted the family of victims of the deadly Massey Energy mine disaster in West Virginia, and negotiated labor policy with BP officials in Louisiana in the wake of the massive oil spill in the Gulf of Mexico. “We had to make sure and insist that BP make available information about clean-up jobs and training in Spanish and other languages,” she said. Solis notes she was satisfied with BP’s efforts, which included specially equipped barges to train and house cleanup workers.“It was really amazing to me because they were abiding by our rules,” she says. Solis has also reached out to thousands of American workers personally. Eliseo Medina, vice president of the Service Employees International Union, said he “grinned from ear to ear” when saw Solis addressing a crowd of Latino workers and advocates at a conference in Houston last year on workplace health and safety.“Never, ever had there been such an event hosted by the Secretary of Labor,” he said. That attitude delights Medina. “Her message to all workers is ‘you are welcome, you are part of this society,’” he said. But Solis’ campaign sparked a wave of criticism from conservative lawmakers and touched off a firestorm on right-wing blogs and websites. Rep. Jason Chaffetz (R-Utah) questioned why taxpayers would spend money to ensure that undocumented immigrants get help from the Labor Department while millions of unemployed Americans can’t find jobs. Solis also inflamed the passions of hard-core Republicans with her support of public employees in Wisconsin and Ohio who were struggling to keep their collective bargaining rights. But Solis is unfazed by political attacks and has stood her ground. Some of that resolve has come from her background, she says. What she learned from her father about labor relations has served her well, as has her early ties to unions and their organizers. It helped her win political support that propelled her to the California State Senate, where she served as Chairwoman of the Senate Industrial Relations Committee and led a battle to increase California’s minimum wage. How does it feel to be Secretary of Labor at a time when millions of Americans are unemployed? It’s actually been quite a challenge. But we’ve been able to tackle the problem of unemployment. While it may be slow moving, we’ve made a tremendous improvement in the unemployment rate…given the dislocation of workers we’ve had. Obviously Latinos are among the groups that have been hardest hit. They’re overrepresented in construction jobs and other [industries] that have suffered the biggest losses. What’s being done to help those Latino workers? The biggest challenge I hear from employers is that they need qualified, well-trained workers. Latinos have to earn, in the very least, a community college degree or a certificate. [President Obama] has helped with that and with financial aid to Latino students. That, in and of itself, is a great statement. There are also opportunities for Latinos to serve in the military and write off [education] loans. And between June 2009 and June 2010, about 3.2 percent of Latinos received worker training, mainly under the Wagner-Peyser Act’s program for dislocated workers. We’ve also given out $150 million in grants from our Pathways Out of Poverty program, which helps workers learn skills required for jobs in high growth and emerging green industries. But much of the increased money for Federal scholarships and worker retraining came from the Stimulus Act, which isn’t likely to be reauthorized, and programs that are now threatened by the budget axe. What are you going to do in the current fiscal climate? Well, attempts [by Republicans in Congress] to cut Pell Grants failed. But we did take some hits on programs. … We’re having to tighten our belts, but we’re being strategic on how we’re doing it. It’s hard because there were cuts to programs we need, including one that retrains construction workers for green jobs. ... I don’t think that [sector] is going to come back that quickly. Thank God the President and our Democratic Senators held firm in saving one-stop employment centers from cuts. You came under fire for defending the labor rights of undocumented workers. Do you have second thoughts about that? No. Labor law has been enforced in the past by both Republican and Democratic Labor Secretaries. Obviously there are unscrupulous business owners who take advantage of vulnerable populations. In 2010, the U.S. Labor Department’s Wage and Hour Division concluded 26,486 cases finding $176,005,043 in back wages for 209,814 employees. Latinos filed a lot of those claims because many came from workers in construction, janitorial job and the poultry industry…industries where Latinos are overrepresented. You also were criticized for defending public employees in Wisconsin and Ohio. I think it’s important for people to understand that this economic crisis didn’t occur because of public sector employees. I think the discussion is being distorted by some. While yes, there has to be a discussion about health benefits and pensions, it has to be a rational discussion. But the President himself said the pensions of Federal workers could be part of a deficit reduction plan. When we’re talking about deficit spending, everything has to be on the table. But we have to be rational. The President has always been very mindful that whatever is cut isn’t something that would help the economic recovery. What reforms have you imposed on the Department of Labor? How has the job changed your life? How is being Secretary of Labor different from serving in Congress? The responsibilities are much greater. You’re on 24/7. And you’re limited in what you can do and say. I pretty much stick to what our purview is. But besides your work at the Labor Department you are also being deployed as an Obama Administration link to the Hispanic community. Yes, I’m doing outreach as is [Secretary of the Interior] Ken Salazar. It’s important for our community to know that there is a place for us Latinos at the table…that we have an investment in the nation.